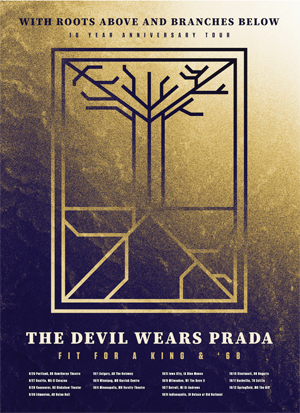 THE DEVIL WEARS PRADA are pleased to announce a very special tour this fall. The band will embark on a trek to celebrate the upcoming tenth anniversary of their landmark third studio album With Roots Above and Branches Below. The band will play the album, which arrived on May 5, 2009 via Ferret Music, in its entirety. Joining THE DEVIL WEARS PRADA on this run will be FIT FOR A KING and '68. "In anticipation of 10 years of WRAABB, we'll be playing the record front to back through the end of this year," said singer Mike Hranica. "Us dudes in the band appreciate record anniversary tours — and with that we wanted to offer the same. We've been looking forward to this for the last year or year-and-a-half — please enjoy."